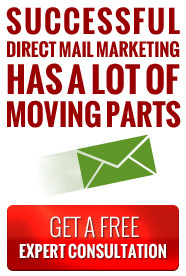 We're delighted to provide turn-key direct mail marketing help, utilizing our close relationships with top-notch partners who provide us with quality work and competitive pricing. Our experience in handling literally thousands of direct mail projects guarantees that your project will be coordinated properly in all phases - from start to finish. Let us consult with you on your mail piece design and suggest formats that get results and maximize your postage savings. Having reviewed thousands of pieces of mail, we can share special copy ideas that get your mail opened with greater responses. Our input before you go to press assures that your mail piece meets all the necessary USPS proper endorsements to minimize handling and postage costs.